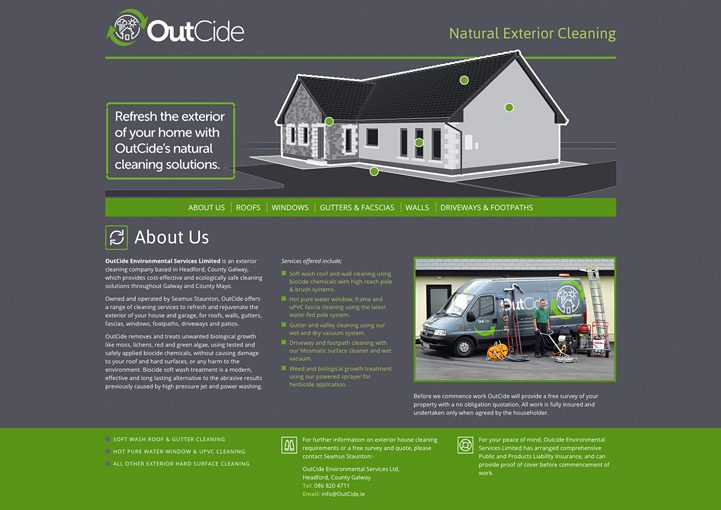 OutCide logo design in Headford, County Galway created by the Zetagram graphic design service. 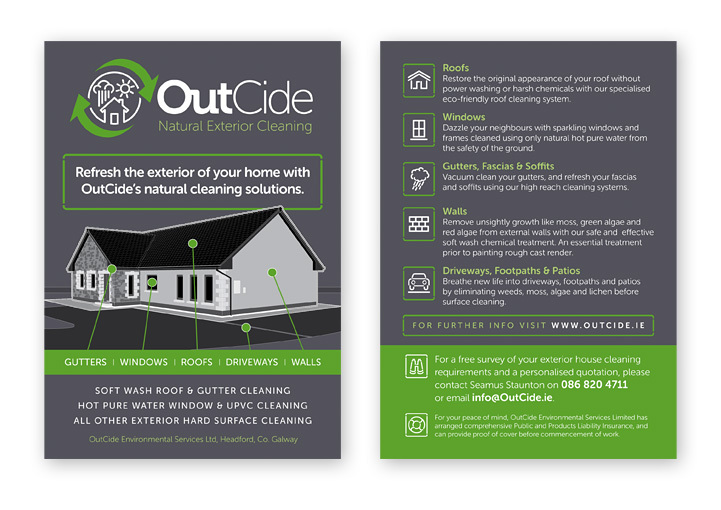 OutCide flier design in Headford, County Galway created by the Zetagram flyer design service. 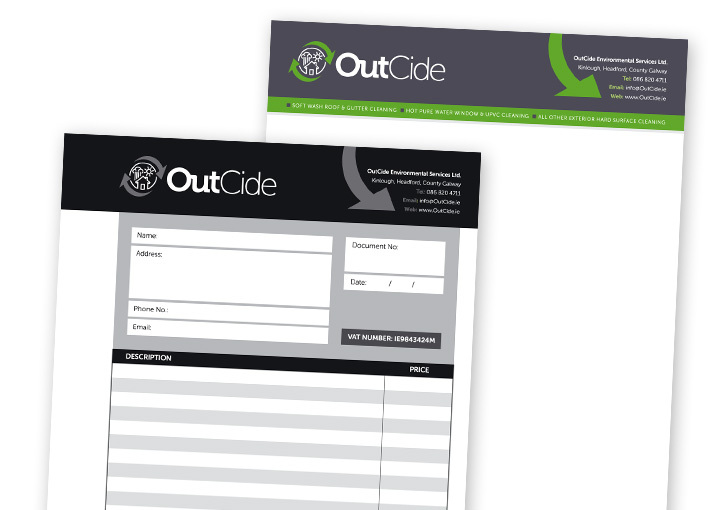 OutCide letterhead design in Headford, County Galway created by the Zetagram stationery design service. 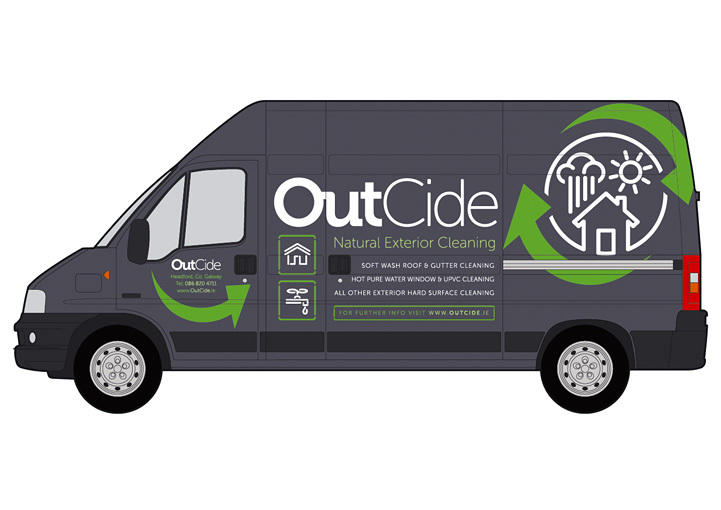 OutCide van wrap design in Headford, County Galway created by the Zetagram vehicle graphics design service. 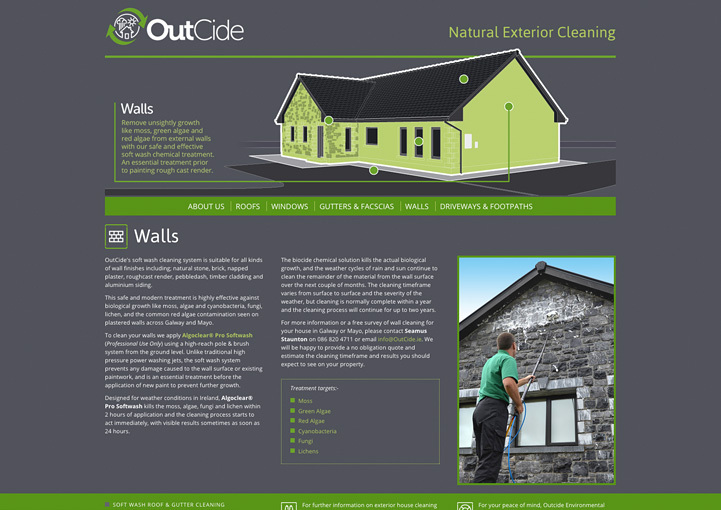 OutCide website design in Headford, County Galway created by the Zetagram web design service. 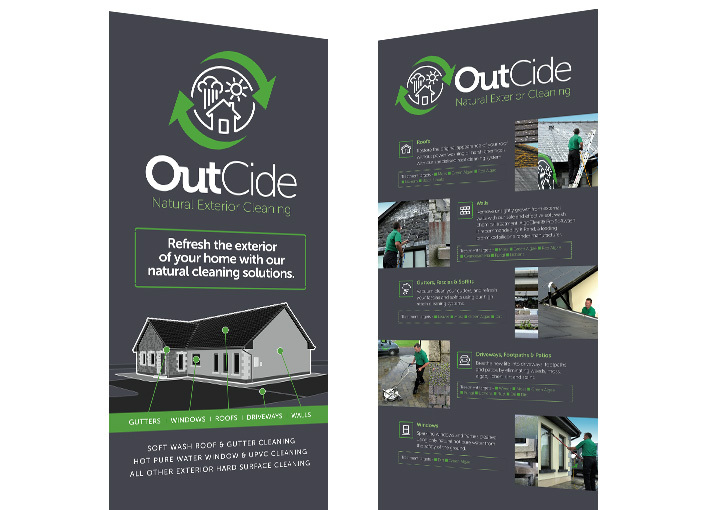 OutCide roll-up banner stand design in Headford, County Galway created by the Zetagram exhibition stand design service. 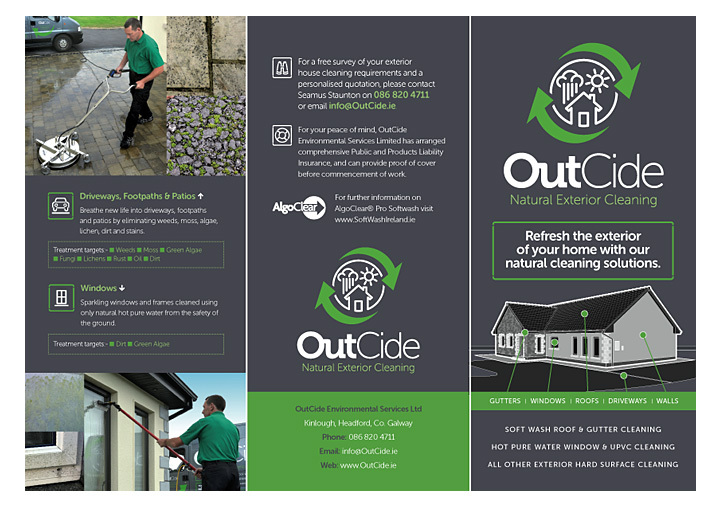 OutCide leaflet design in Headford, County Galway created by the Zetagram brochure design service. 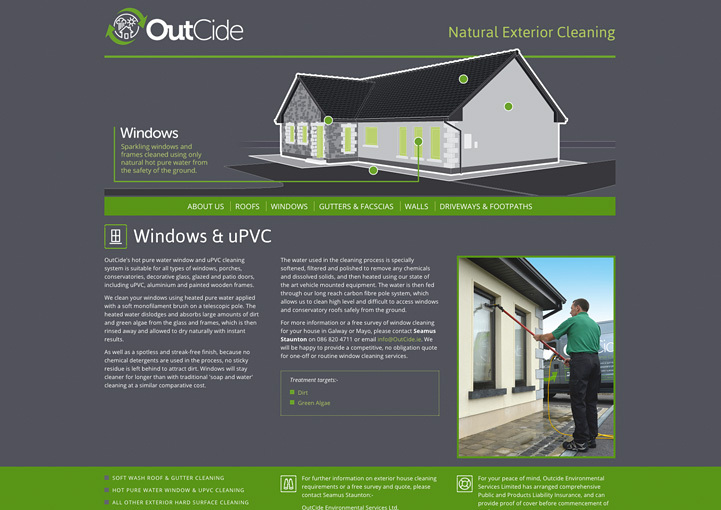 OutCide was a small, independent start-up exterior cleaning business based in Headford, County Galway, which provided natural biocide cleaning solutions for roofs, walls and windows across Galway and Mayo. 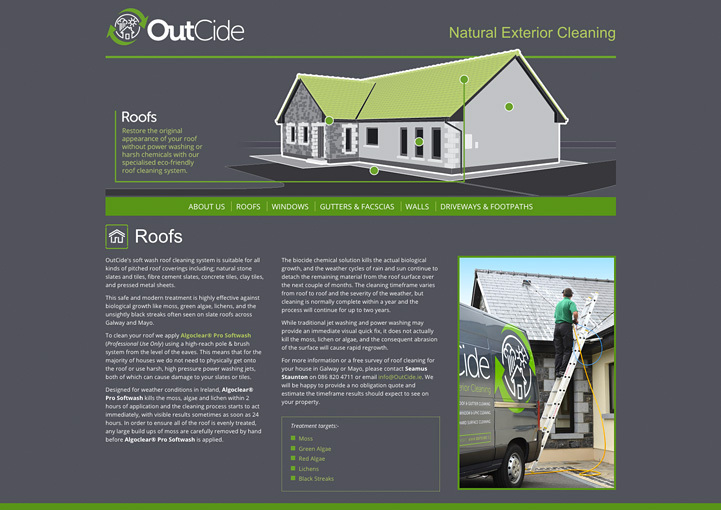 The initial brief to Zetagram* by the client was for the business to start strong, with a 'scaleable' corporate identity that could expand and grow as the business evolved. 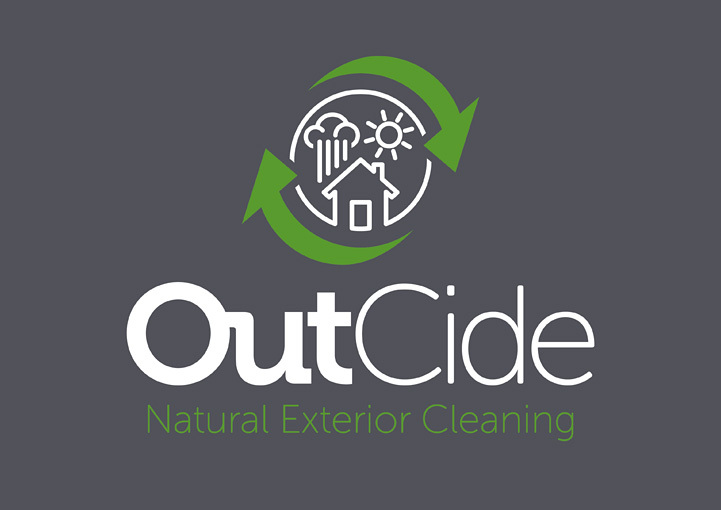 The name OutCide was developed and chosen by the client as it was unique enough to use as a business name and also relates to the biocide cleaning process. 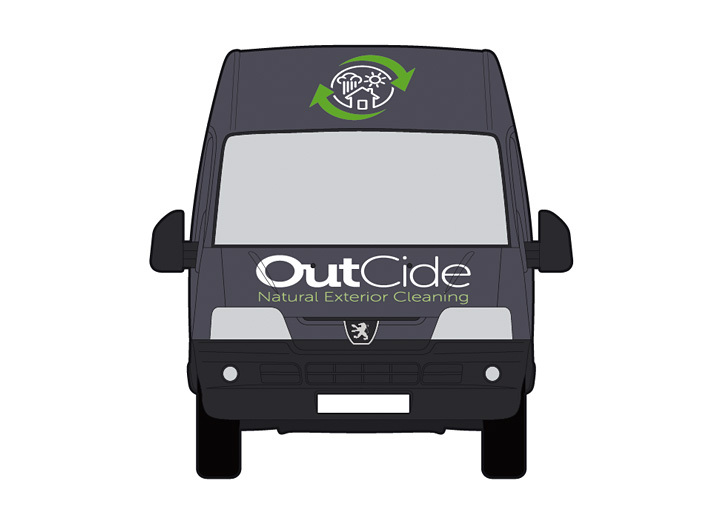 After research and analysis, the starting point for the design was the existing van fitted with the cleaning equipment which was already painted a dark grey. 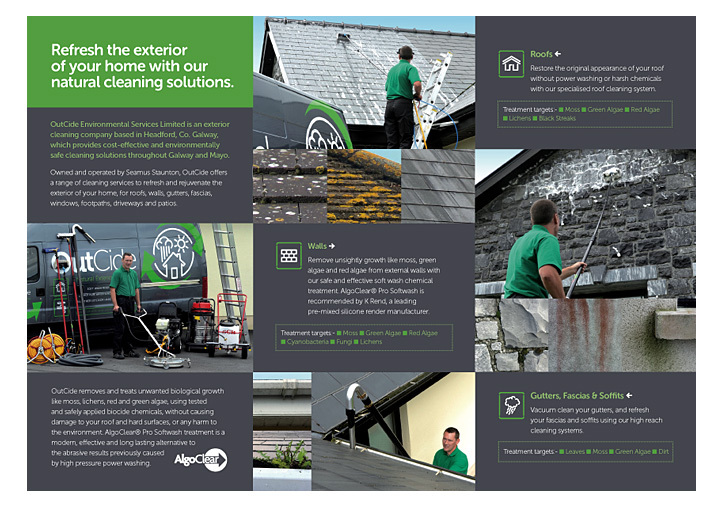 To provide a professional and cost-effective solution, Zetagram integrated this paint colour into the corporate identity and designed the rest of the marketing material around this. As a foundation, Zetagram developed a strong, graphic logotype in colours that would stand out against the grey background, be eyecatching and complement the 'natural' element of the process. 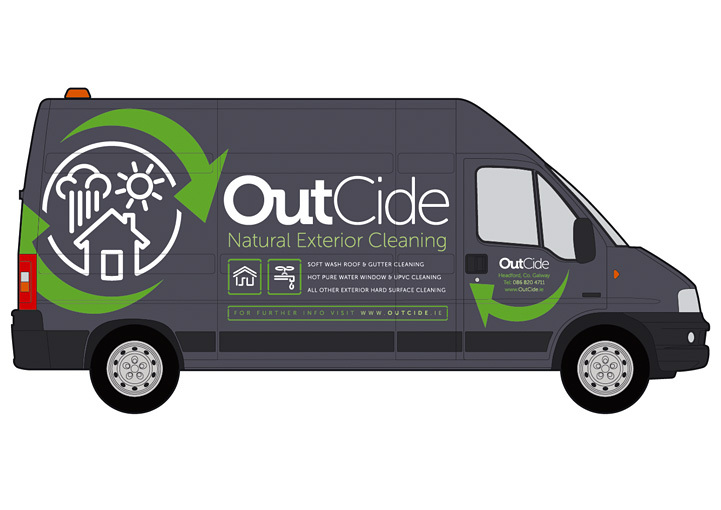 The motif itself reflects the process of weather cycles to remove stubborn growths like moss and algae, after the initial biocide treatment. 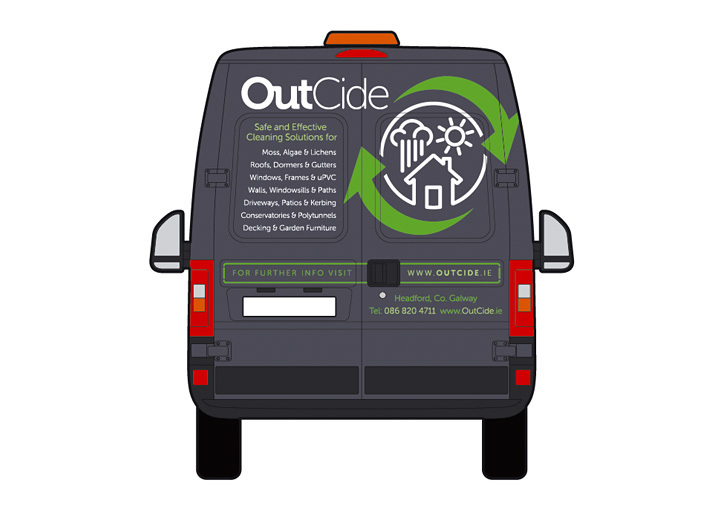 The van was designed to be economically produced, and acted as part fleet graphics and part advertising medium, to direct enquires to the website. 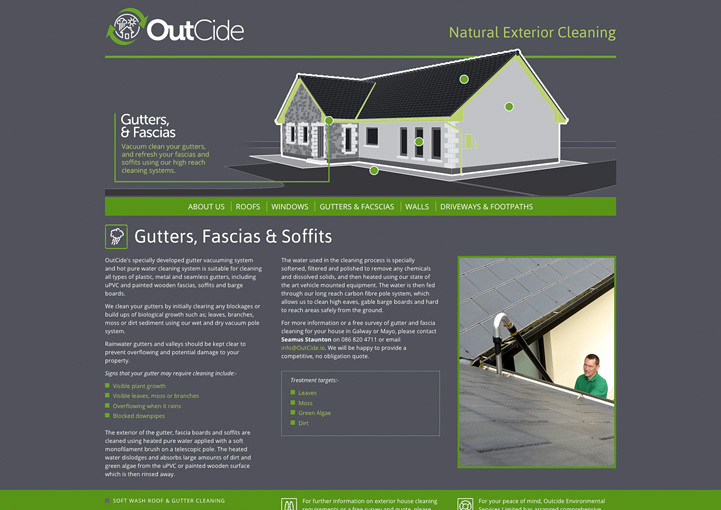 The website itself was first written by the client, edited and optimised by Zetagram, and restructured into a custom designed responsive brochure website design reflecting the fonts style and colours of the new corporate identity. 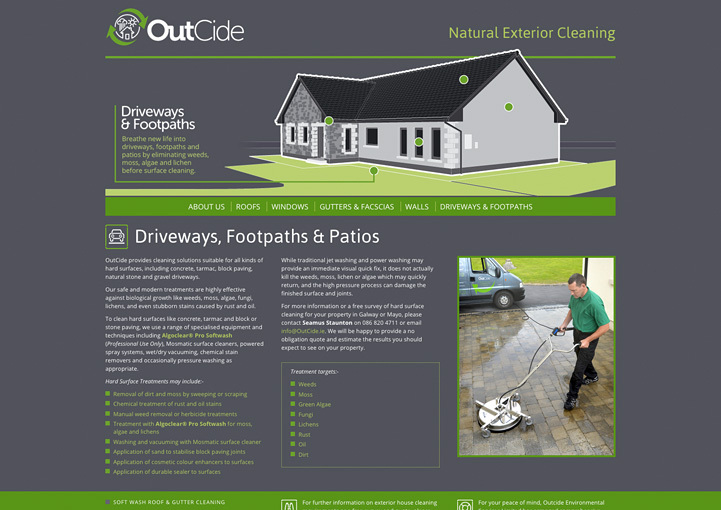 The graphics were custom drawn and the photography was shot on location by Zetagram.